Who Is Next Senate President As Battle of Wits Begins? Senate Leader, Ahmed Lawan, has promised to run a bi-partisan National Assembly if elected as Senate President. 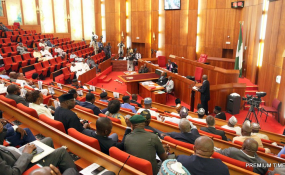 The lawmaker also promised to respect the decision of the All Progressives Congress (APC) should the party decide to zone the position away from North-east. He made his intention known while speaking with journalists in Abuja recently. His comments formally announce his intention to run for Senate Presidency in the 9the Senate. Despite occasional disagreements, Mr Lawan said the ability of principal officers to carry everybody along had always been the secret of legislative chambers to delivering meaningfully on their mandate. However, he said that everything should be done in the interest of the people, adding that, "we are senators of the Federal Republic of Nigeria, even though coming from different parts of Nigeria. "When we legislate, we legislate for the entire country and therefore we need to remain united and focused. "I was in a position for 16 years from 1999 to 2015 before I became part of the ruling party; I am glad, I thank God for that. "But even as an opposition, we knew where we opposed the government and where we cooperated with them," NAN quotes the legislator as saying. He noted that every legislator works in the interest of the people not based on sentiments. "For instance, will there be any legislator who will oppose any legislation that will enhance the performance of our armed forces or the Police to provide security? "No! Whether you are All Progressives Congress (APC) or People Democratic Party or Young Progressive Party, we have the same people to serve. "So, we will work to ensure that we achieve and attain that desired unity within the chamber. There will be equity and fairness in our affairs. "I am sure that once we are able to unite around national interests we will contribute meaningfully to governance". Mr Lawan, who represents Yobe North is vying for the position for the second time. In 2015, the APC endorsed him following zoning of the position of the president of the Senate to the North-east. However, he did not make it as the incumbent, Bukola Saraki, emerged president of the Senate though against his party's wish. Mr Saraki's reign was characterised by constant face-off between the executive and legislature even before he dumped the APC in 2018. On Legislature, Executive relationship, Mr Lawan said while the separation of powers was designed to ensure checks and balances among the arms of government, the ultimate goal was to serve the people. "I always say that the Constitution provides for separation of powers and I always define separation of powers may be unorthodox but I believe in that. "The separation of powers does not amount to the independence of government. "It is the specialisation of the arms of government. The executive cannot function without the legislature and the legislature needs to work with the executive in a cordial manner. "However, that does not take away that special function of oversight. It does not take away ensuring that what we do in the legislature is to support the executive. "Who says we will never disagree with the executive; by constitutional design, we are meant to disagree, hold different perspectives from time to time on issues. "But when we disagree, I always say, we should sit down and look at issues and take a decision that is in national interest, " he said. Mr Lawan promised to respect the wish of the party, should the position be zoned to a region other than the North-east. He said, "I am a loyal party man. I will respect the decisions of my leaders and my party." Mr Lawan ruled out the possibility of crisis in the APC over the leadership of the 9th National Assembly. "We are not in any way thinking that we will have crises; it is not what we are envisaging at all". "But let me say that our party, the APC, must have learnt its lessons, and therefore, the party leadership will do something differently this time. "I am sure our leaders will try to manage this huge success of the APC. "And I have no doubt the party will find us compliant and very supportive of its programmes and those of the administration under President Muhammadu Buhari," he said. Also at the forum, Anambra South Senator-elect, Mr Ifeanyi Ubah, declared support for Mr Lawan. Elected under the Young Progressives Party (YPP) on February 23, Mr Ubah is one of the 11 senators-elect who were with Mr Lawan at an interactive session with journalists in Abuja. Mr Ubah told journalists that Mr Lawan is a good man with the best experience in the Senate, hence his decision to pitch tent with him. "Lawan is a very good man, and has the best experience, I believe in the Senate. For me it is a free world, it is democracy. "So, I am free, and I am pinching (pitching) tent with him because I believe he is the kind of leader we need in the 9th Senate," Ubah said. Asked why he is associating with a member of the APC widely seen as an unwanted party in the South East, Mr Ubah said he could not be an island in the Senate. "It is a choice anybody has to make. I can't be alone in the Senate. If any group comes up and wants to lead the Senate, it is a duty for me to look at them and see if I can pinch (pitch) tent with them."